Amalfi coast seems to be the result of a painter who wanted to use the warmer color gradients for creating a landscape. This is what attracts the visitor at the first shot. It is the land of lemon in harmony with the most aromatic Mediterranean vegetation and the aroma of saltiness. The Amalfi Coast is known for its production of limoncello liqueur as the area is a known cultivator of lemons, known as sfusato amalfitano in Italian. It is also the land of bougainvillea and carnations pergolas. A vertical landscape characterized by a picturesque labyrinth of stairways and narrow alleys, that connects the two main elements of this landscape: the mountains and the sea. 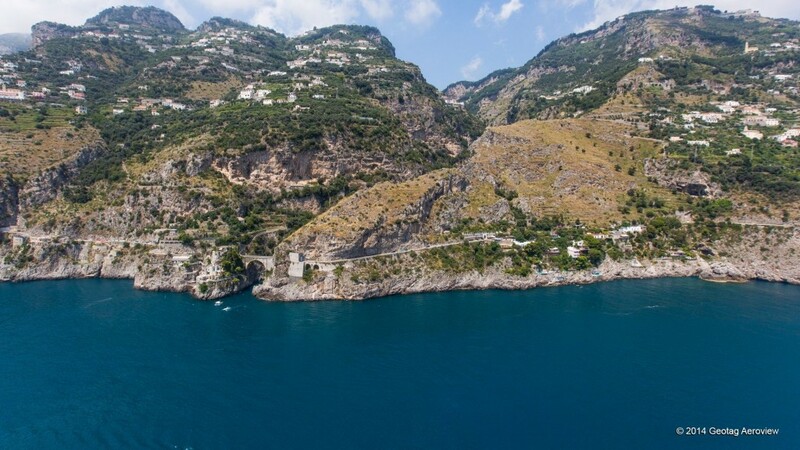 Amalfi landscape is a continuous succession of headlands and inlets, bays and fjords, interspersed with pebbled beaches and rocks on which you can still see the ancient towers. The shift from the sea is seamless: the mountain sides were terraced over the centuries, shaped by human labor to create a unique creation. Following the natural course of the coastline, the route is full of curves, nestled between the rock and the sea cliffs, giving new and spectacular shots at the exit of every tunnel. 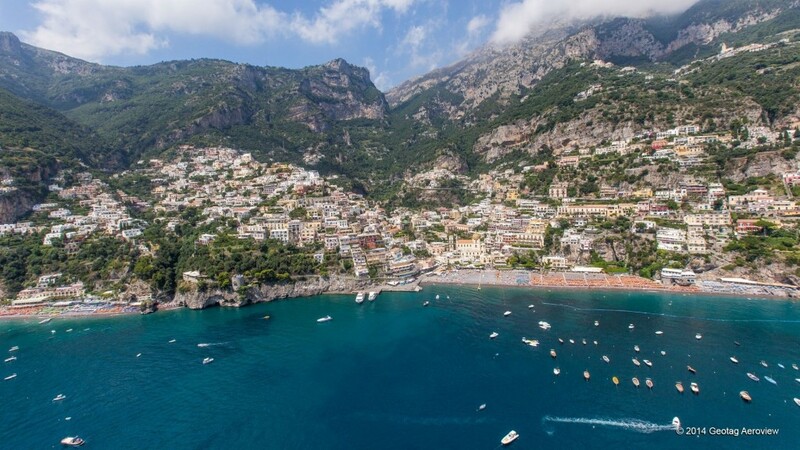 One of Europe’s most desirable and romantic destinations, also ideal for family and luxury vacations, the Amalfi coast has been seducing visitors since antiquity. There are 13 villages spreading across the land declared by UNESCO "World Heritage Site". 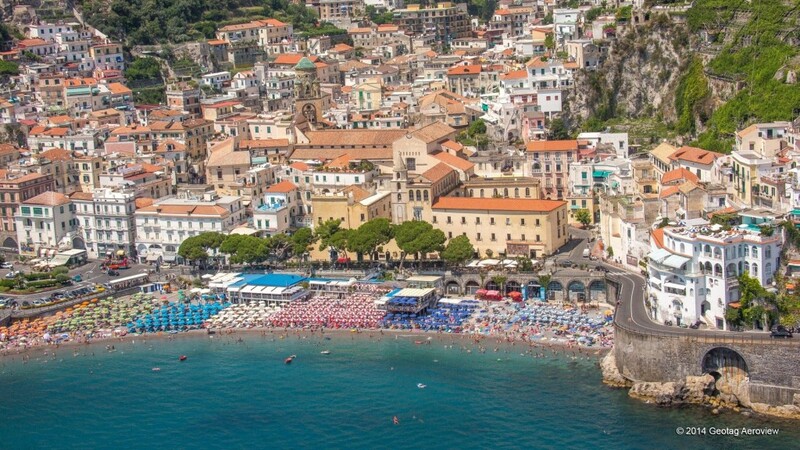 Amalfi, the town that gives its name to the coast, is situated at the mouth of the Valle dei Mulini. It is the coast’s busiest town, but still it is a very pretty little place fringed by lemon terraces with a spectacular setting between sea and mountains. It looks like a cluster of white houses clinging to the rock and connected to each other by covered alleys and stairways. 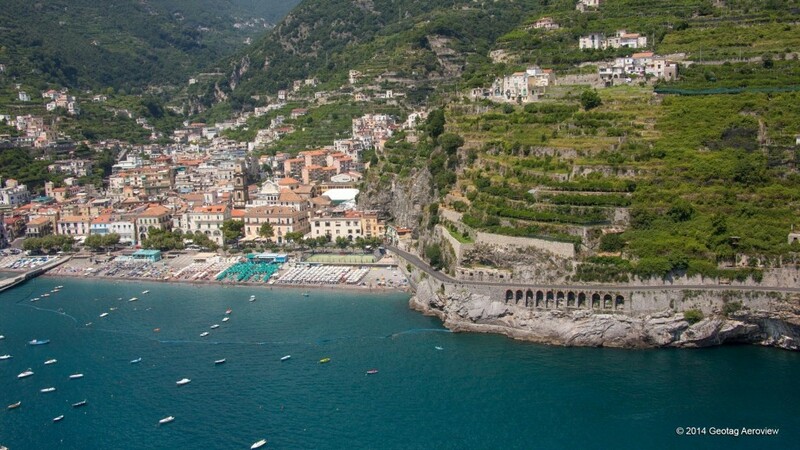 Amalfi is a good base for exploring the area and other towns like Positano and Ravello. Positano is to the west of Amalfi, and is well known for its picturesque staircases, whitewashed houses following the natural course of the mountain and creating a vertical landscape. This postcard landscape was well appreciated by international artists after the First World War and it is famous for its handmade leather sandals and cotton/linen clothes, also called "Moda Positano". Ravello is famous for its beautiful gardens perched high in the mountains above the sea, and for its classical music concerts. This postcard landscape and its noble atmosphere was a source of inspiration for Richard Wagner who imagined the magical gardens of Klingsor admiring Villa Rufolo gardens. It is already praised by the Italian poet Boccaccio in his Decameron. Ravello is a spectacular cliff top town, famous for its magnificent villas. It has a sandy beach enclosed on three sides by soaring rocks. The beach has a central bathing establishment and a free area on each side. 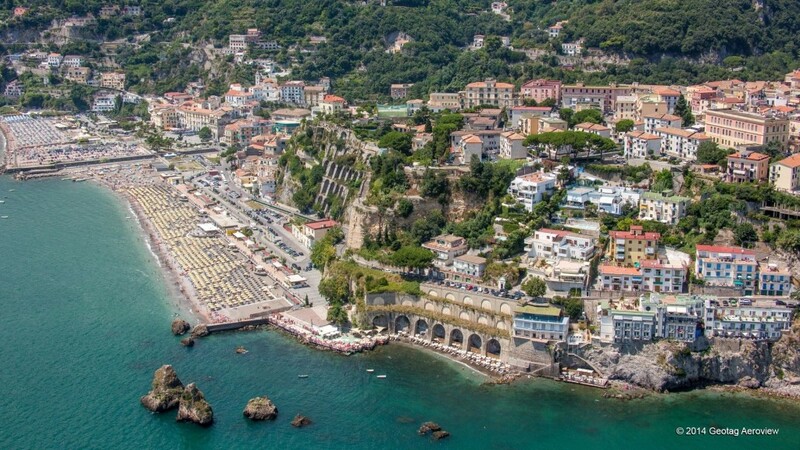 Vietri sul mare is the first town of the Amalfi coast coming from Salerno and worldwide famous for the production of bright colored artistic ceramic. Cetara, is an active fishing port specializing in the processing and storage of tuna and anchovy. Erchie is a picturesque part of the town of Maiori with ancient origins. According to the tradition Erchie was founded by Hercules, who stopped at the foot of the Mount Falerzio; now it has about one hundred residents. During the Middle Age Erchie enjoyed theius piscariae, which allowed the population to use the tenth part of the catch, thanks to the presence of the powerful Benedictine Abbey of Santa Maria de Irchi in the area. On the eastern side of the nice beach there is the imposing quadrangular bastion of medieval origin, built by Charles I of Anjou in 1278. 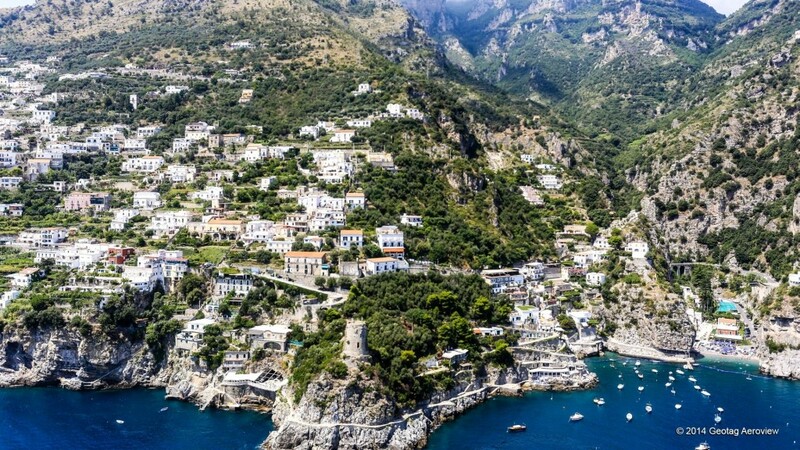 Small white houses perched on the hill, narrow alleys, the scent of the lemon treed terraces, the pebble beach, the fresh breeze and a crystal-clear sea: all the characteristic features of the Amalfi coast enclosed in a few square kilometres. Maiori was the favorite setting of the Italian director Roberto Rosellini. A mix of towers, marinas, castles, neoclassical buildings vaulted houses characterized the village. Minori has a long tradition in the production of handmade pasta as well as in the processing of the famous Amalfi coast lemon. Surrounded by lush terraced gardens, the small town hides architectural treasures of great value. 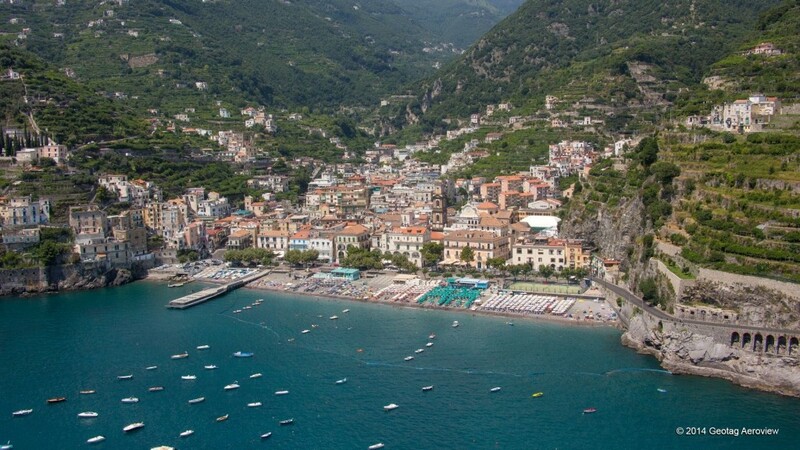 Conca dei Marini is a coastal village with a centuries-old maritime tradition. It is a natural balcony overlooking the sea, surrounded by lemon tress. 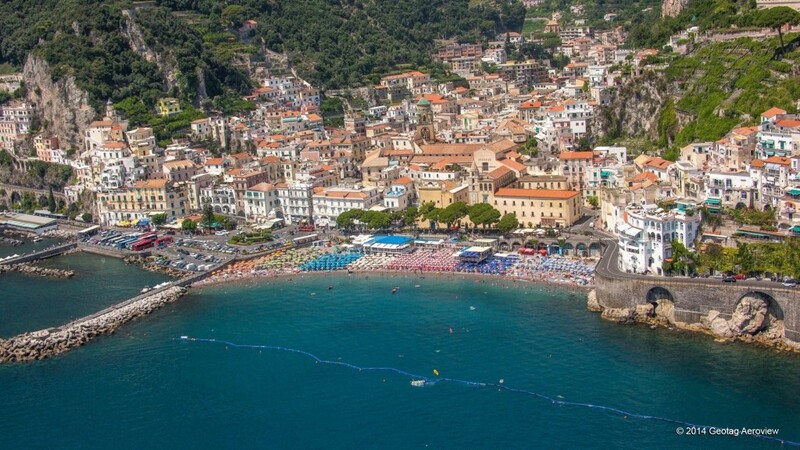 Furore, is, first of all, the town of the fjord, carved over the centuries by the river Schiato and where every first Sunday of July takes place the MarMeeting – High Diving World Championship. Praiano, is far away from the mass tourism and is characterized by narrow streets leading directly to the sea. Here you can enjoy the most romantic sunset of the whole coast. Scala is the oldest town of the Amalfi coast is surrounded by dense forests of chestnut trees. It still preserves its quite and relaxing atmosphere that perfectly harmonizes itself with the rich historical monuments. Tramonti is the hilly town of the Amalfi coast and is the perfect place to enjoy the authentic flavors of local cuisine. 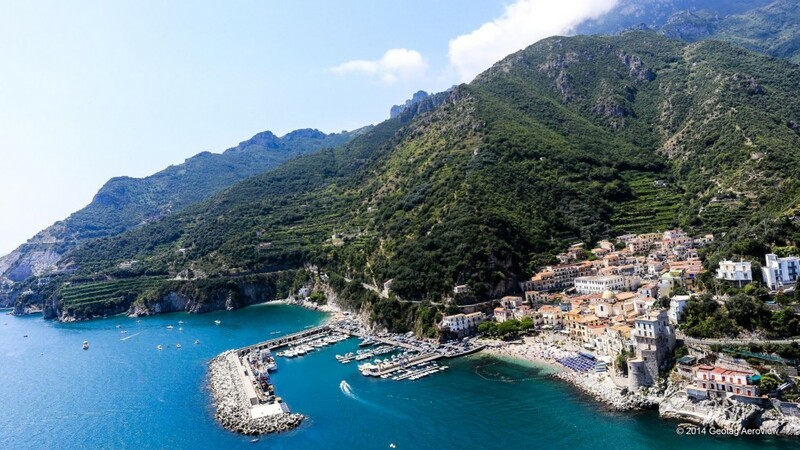 Whether you're looking for a crowd, super-organized beach or a quiet beach, far from the crowds, Amalfi, and the surrounding area, is the perfect place to find. 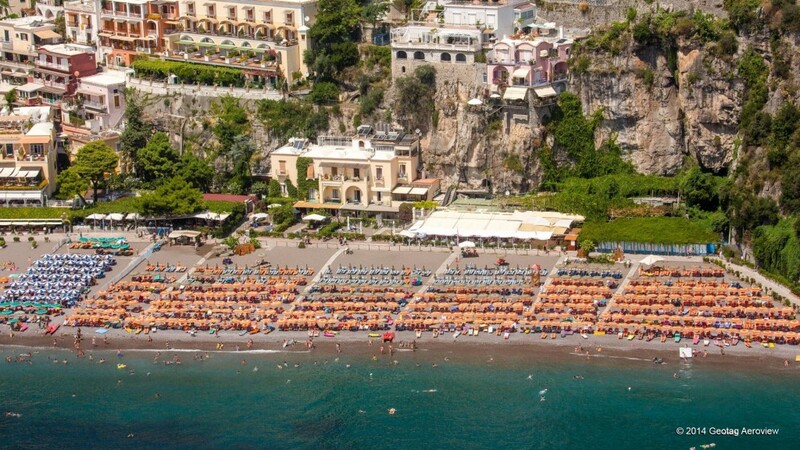 Marina Grande, Positano's main beach is one of the liveliest and most cosmopolitan of all those on the Amalfi Coast. Along the large, three hundred meter long beach, which lies almost directly opposite the archipelago of Li Galli, there is a string of restaurants and bars. Its easy to see why the beach has become the focus of the town's social life, where the locals come to mingle with the world's celebrities and tourists. 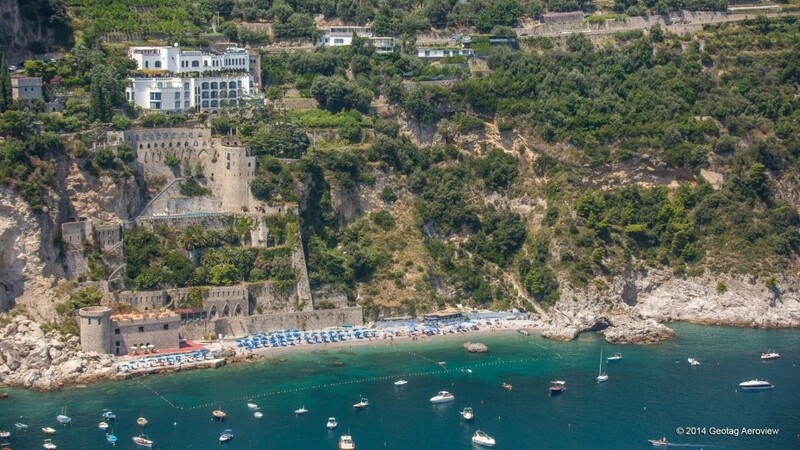 Amalfi's largest beach, situated directly opposite the town's picturesque historic center, is also its most popular. Marina Grande has a number of glamorous bathing establishments as well as a small section of 'free' beach. 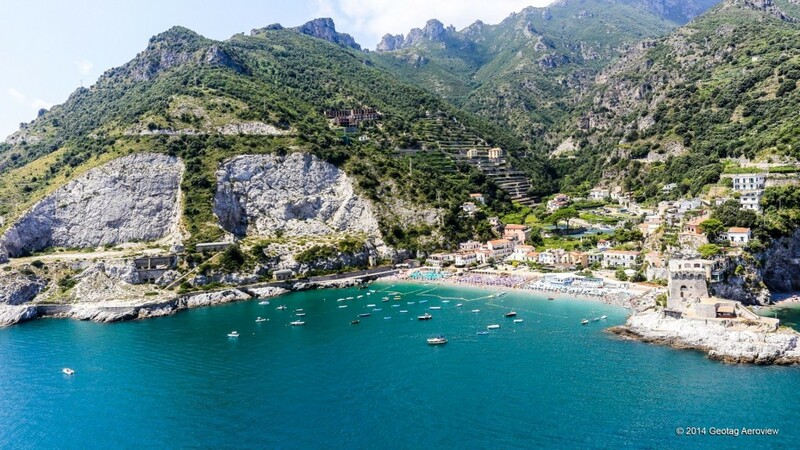 Despite the size of the beach (big by Amalfi Coast standards), during summer weekends you'll want to arrive early to ensure you find a place here. 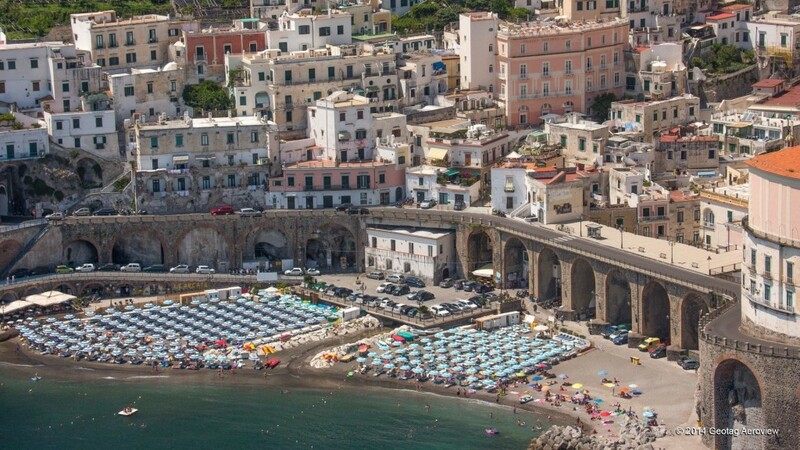 Atrani, a beautiful and charming town that offers the visitor the pleasure to spend relaxing moments in the main square, away from the mass tourism and very close to the beach. 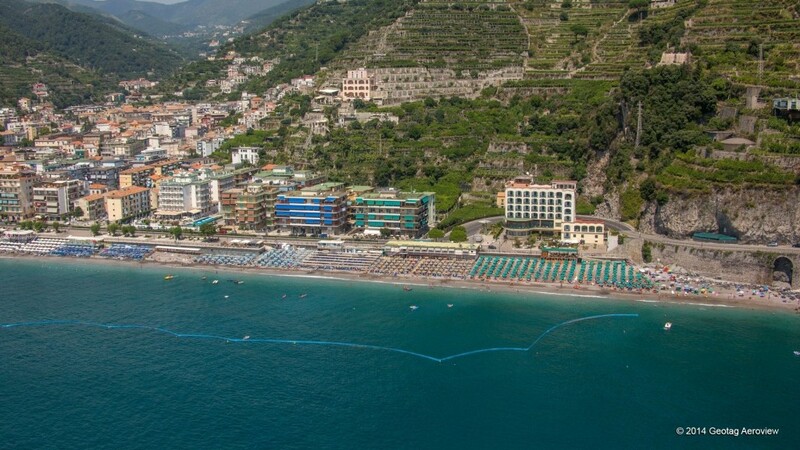 Atrani beach is a popular choice amongst families with small children. 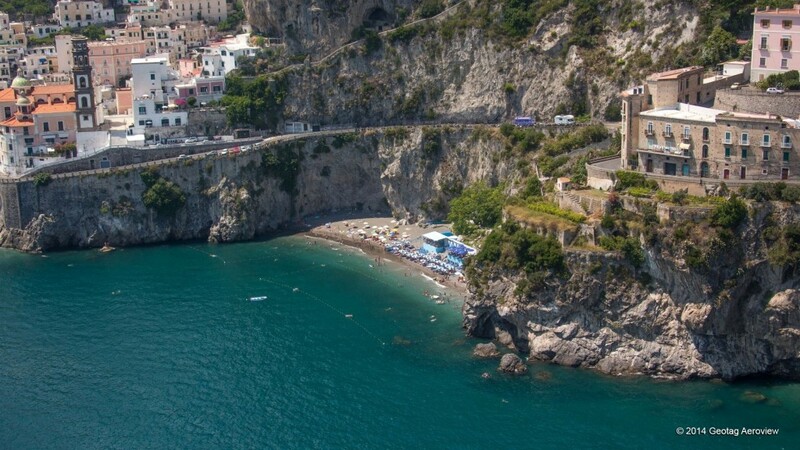 Maiori beach is one of very few sandy beaches on the Amalfi Coast. The beach is almost completely occupied by bathing establishments. Minori beach is a 250 meter long, sandy beach. In the middle of the beach there are 3 bathing establishments, to either side of which the beach is 'free'. Minori beach faces south and is bathed in sunshine for much of the day.